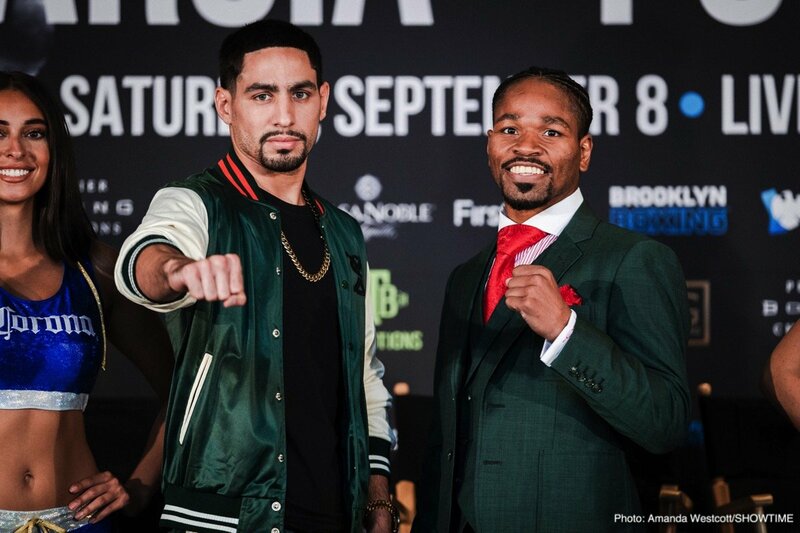 Danny Garcia and Shawn Porter do battle this Saturday night at the Barclays Center in Brooklyn, New York, live on Showtime. The WBC belt vacated by Keith Thurman is at stake for the winner. The real prize for the winner is advancing to the next round of this drawn-out unofficial PBC welterweight tourney. Also, for the winner Errol Spence and to a much lesser extent Keith Thurman, are waiting in the wings. The undercard features mostly middle-level bouts that may be interesting from a style standpoint. Since Porter’s fight with Keith Thurman in 2016, Shawn has been patiently waiting for another big opportunity. Porter had two stay busy outings in 2017 and a hand injury forcing him to the sidelines for a few months. He tried to hold out hope for a Thurman rematch unfortunately that fight fell to the waste-side after Keith had another injury setback. Now with his eyes set on Danny Garcia will Porter make the most of it? Danny Garcia took his first loss last year against Keith Thurman. After taking the rest of 2017 off for personal healing one might say, Danny shook off the rust with a scintillating knockout of Brandon Rios back in February. Now Garcia is faced with a tough challenge trying to contain a runaway train in Porter. Danny Garcia is the king of the Barclays Center selling the most tickets of any fighter and it’s not even close. Porter is no stranger to Brooklyn having fought their in his the last 3 fights. Either way it’s safe to say if this main event on Saturday comes down to the wire Danny will likely get the nod. In a roundabout way we could label this matchup as the matador versus the bull. Although this bull (Porter) will rush in with loose defense and tends to smother his offense. The matador in Danny Garcia is not a typical flashy and full of finesse defensive fighter, rather using subtle movement and timing to catch opponents with hard left hooks in the middle of exchanges. Both men have talked about the game plan a fair amount in the lead up. Garcia claims he won’t shy away from going toe to toe. Porter has stated numerous times he will give fans a new look from the outside instead of just his normal reckless abandonment. Obviously, Garcia is not afraid to engage up close but it’s doubtful he will stand and trade with Porter for most of the rounds. Same with Porter, sure he did some decent work on the outside against Adrian Granados, but we shouldn’t expect 12-rounds of that versus Danny. The main ingredient for Garcia will be patience and poise as he will be forced to overcome Shawn’s activity and quite frankly, Porter’s big head. Garcia has faced several come-forward fighters like Lucas Matthysse, Robert Guerrero, and most recently Brandon Rios. The difference from those names and Porter, is foot and hand speed. One could make a case those 3 can be more efficient on offense rather than getting to close to an opponent rendering Porter somewhat useless when the ball is in his court to punch. In the first half of this fight Danny will get hit a lot and look to hold or complain to the ref. At some point Garcia will make minor adjustments. Garcia is an underrated fighter on the inside and to an extent on the outside. A side step here, a perfectly timed short punch there, slowly but surely Garcia will chop down Porter leaving only the stump. This hack-of-a-scribe sees an action-packed scrap filled with two-way drama topped-off with a healthy heaping of ugly. The opening frames could be mild as both boxers figure out what works best. The fists will be flying at a semi-rapid pace after a few rounds. Look for both men to hurt or at the very least buzz one another. Of course with Porter in the ring the fight will get downright dirty in the trenches, it’s up to Danny to answer the bell on the inside. The pressure Porter applies will give Garcia hell and probably a good scare in spots. Roughhousing from Porter will wear on Danny but will the judge’s scorecards reflect that hard (dirty) work? Using a bit of Porter’s own medicine of foul play along with the cleaner punching should be enough for Danny to get the nod. Just short of a fight of the year result but a pretty dang good brawl is in order. One thing is for sure, this fight will be won or loss in the trenches. My Official Prediction is Danny Garcia by Majority Decision. Side Note: HBO’s offering on Saturday night doesn’t measure up to Showtime’s main event. Even if the names and matchmaking doesn’t resemble the first two ‘Superfly’ events, you may still want to DVR the card from an entertaining point of view.